ChiIL out with ChiIL Mama. We're giving away a free 4 pack of tickets. Enter below for your chance to win. Open through midnight January 31. 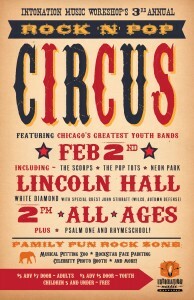 On Saturday, February 2nd, The Intonation Music Workshop will present its annual Rock-N-Pop Circus, an afternoon showcase featuring student bands THE POP TOTS, WHITE DIAMOND and THE SCORPS at Chicago's famed Lincoln Hall. This all-ages concert is by kids, for kids, and features lots of activities to keep the whole family entertained – the perfect way to spend a winter afternoon! Joining White Diamond will be Wilco’s John Stirratt, who has been mentoring the up-and-coming rock band at IMW's Fosco Park location. Also appearing will be legendary Chicago MC Psalm One and her students in RHYMESCHOOL (a joint program with IMW focused on hip-hop) and kid-friendly indie pop from Future Hits! The family-friendly musical extravaganza will also offer Rock Star Face Painting, a Celebrity Photo Booth, a "Musical Petting Zoo"and more!